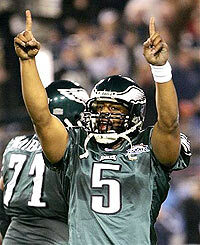 The Eagles will have Donovan McNabb back for their season opener, an d still have Brian Westbrook at running back. The receiving core is solid, making the Eagles a constant threat on offense. Defensively, the secondary is also solid, but their 2006 run defense was horrible. A new linebacker core including Takeo Spikes should make the Eagles greatly improved in that aspect of the ball. This team is completely capable of a Super Bowl run. The Cowboys are returning an excellent offense with Tony Romo at QB Julius Jones and Marion Barber at running back, and Terrell Owens receiving. The Cowboys’ biggest weakness was their defense, and they are slightly improved this year in that category. With Bill Parcells no longer coaching, the player seem to be more confident, especially defensively where players were living in constant fear of failing Parcells. Unlike the Eagles and Cowboys, the Giants seem to be on their way down as Tiki Barber’s retirement leaves Tom Coughlin with no legitimate running back. That means the bulk of the offense will be on the shoulders of Eli Manning. Even if Manning has a breakout year, it still may not be enough without any kind of a running game. Defensively, the Giants are mediocre and did very little to improve over the off-season. Michael Strahan’s holdout did not help the team focus during camp either. This team has a possibility to be good, but it is much more likely that one thing will go wrong, distract the rest of the team, and then destroy the season. The Redskins have no real Quarterback, a depleted running game, and had the league’s worse defense last year. The offense will surely struggle, but the defense is more important to the Redskins. They completely changed their starters and brought in a bunch of new faces to try to reinvent their defense. The Redskins show very little promise and will not win many games until they can find a franchise quarterback and young defense. The Bears have a great defense and great offense, but the season will eventually depend upon Rex Grossman. Grossman’s struggles have been well documented, but he is still the Bears’ starting QB. The defense and offense return all, but two starters making them a clear Super Bowl candidate. If Grossman cannot come through in pressure situations though, this team will lose early in the playoffs. The Packers return long-time QB Brett Farve, though his talent has diminished as he as gotten older, and an excellent defense. The running back position is a big question mark with Ahman Green leaving, so Green Bay will rely on Farve for almost all of the offense. If the defense stays good, Farve continues his solid play, and a running back steps into the spotlight, this team will be dangerous in the NFC. The Vikings have a solid team with Adrian Peterson as the starting running back and a very good defense (especially against the run), but have many questions at quarterback. If Tarvaris Jackson proves to be a solid quarterback, this team can be good, but chances are that Jackson will be mediocre and nowhere near good enough to support the Vikings for an entire season. The Lions are improving with another great receiver (Calvin Johnson) for QB Jon Kitna to throw to, and a better offensive line, but the overall level of play will not be nearly enough. The defense is mediocre at best with an improved linebacker core, but still not good enough to hold teams in pressure situations. This year will bring a bout a couple more wins, but not close to enough to put this team near playoff contention. The Saints come into the season as a Super Bowl favorite and rightfully so. Drew Brees should have another great year at QB and Reggie Bush continues to improve at RB, but the defense needs to get better. 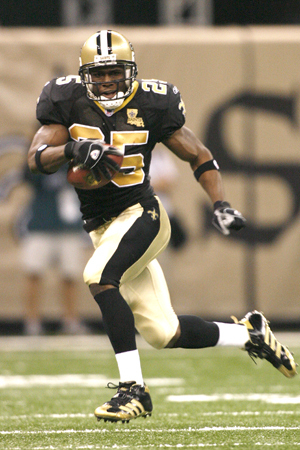 Big plays really hurt the Saints in 2006, but off-season acquisitions should solidify the secondary and put this team in the Super Bowl. Carolina is not far away from a Super Bowl either as the offense is loaded and defense very good. A great running back tandem in DeShaun Foster and DeAngelo Williams, a great receiver in Steve Smith, and an excellent QB in Jake Delhomme makes the team an offensive powerhouse. The defense is not the best in the league, but it is still very good and should carry this team if not to a division title, than certainly to a playoff berth. The Buccaneers have a very questionable quarterback in Jeff Garcia, an inconsistent RB in Cadiallac Williams, and a mediocre defense. Garcia is a huge unknown, and Cadiallac’s durability was questioned after a bad year last year. Furthermore, the defense is not nearly good enough to support a bad offense. Bucs’ fans will struggle through loss after loss, while the team searches for its identity. The Falcons seem to be the worse team in the league as losing Michael Vick leaves this team with no QB, and Warrick Dunn’s back injury leaves the team with no RB. The offense is miserable and the defense is not very good either. Falcons’ fans better get ready for a long season, because there will be very few wins. The Seahawks have a very good team returning this year, starting with QB Matt Hasselback and RB Shaun Alexander and a much improved defense. Hasselback is not a superstar, but he is a good QB and, with Alexander, gives the Seahawks a dangerous offense. Defensively, the Seahawks bolstered both their defensive line and their secondary bringing a couple of free agents, including left end Patrick Kerney. The great offense and solid defense could easily make this team a Super Bowl contender. The Cardinals are a team that should come into form this year. With Matt Leinart having a year of experience, he should improve into a very good QB, especially sine he has Edgerrin James at running back. Off-season acquisitions have strengthened both the defensive line and the secondary of the Cardinals. Though big things aren’t expected of this team, don’t be surprised to see Arizona make the playoffs and even advance a couple rounds. 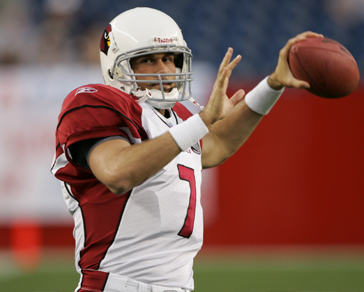 The St. Louis Rams gave QB Marc Bulger a huge contract in the off-season and he needs to live up to it this year. RB Steven Jackson will take some of the load off of Bulger, and make this Rams offense even better. The defense is a different story. Though the secondary is slightly improved, it is not nearly good enough to prevent big plays. Even on the defensive line, the team has a couple of weaknesses. No matter how good the offense is, the defense is not going to be able to hold leads. The 49ers offense is good, but there are still many questions there. QB Alex Smith needs to take his game to the next level and give the 49ers a shot at a playoff berth. RB Frank Gore has emerged as a very good back, but also needs to raise his game just a little bit. If they can do that, the 49ers could be a great team. The defense is much improved with a lot of off-season signings that bolstered the secondary. Though the 49ers have a lot of potential, Alex Smith just is not ready to take this team to the playoffs.